The concept of Special Drawing Rights is essential for understanding the working of International Monetary Fund. Some questions may be asked in various examinations testing the knowledge of the candidate in this regard. Special Drawing Rights are understood basically IMF’s currency in the general economic sense. This is not really correct usage, but conveys the meaning. 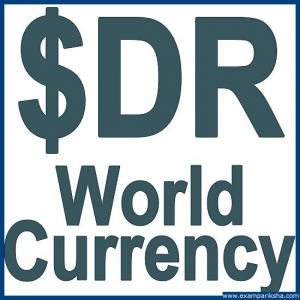 The SDR are the unit of account in International Monetary Fund. The SDR play the role of a supplementary reserve asset. The Special Drawing Rights (SDR) are basically an international reserve currency used as an asset, that was created by IMF in 1969 in order to supplement the existing official reserves of member countries. The member nations can exchange SDRs for hard currency at the IMF. The value of SDR is based upon a basket of key international currencies including US Dollar, Euro, Yen, and Pound sterling. This basket compilation is reviewed in every five years to ensure that it reflects the relative importance of currencies in world’s financial system. through the voluntary exchange of SDRs between member nations under their arrangements. The IMF designates members who have a strong external positions to purchase the SDRs from those members who have a weak external position. Before the creation, the international economic community had to face various restrictions with increasing amount of world trade and the level of financial development where gold and US dollars (which were in limited quantities) were the only means of trade and commerce. To address this issue, Special Drawing Rights were created by the IMF. It is popularly called as Paper Gold since they are generally used for various accounting purposes. The Special Drawing Rights (SDR) of IMF are not backed by any currency or precious metal. It is only used among governments and the IMF for settlement of balance of payments. In layman’s terms, Special drawing Rights or SDR are a measure of a country’s reserve assets with the IMF. While it is not really money in a strict sense, they still have characteristics of money like they are store of value, interest bearing assets, means of settling debts. The Special Drawing Rights (SDR) are distributed among all member countries of IMF according to the proportion of each member nation’s quota of IMF dues on the basis of country’s GNP. SDR’s are generally used to supplement gold and convertible currencies for maintaining stability of foreign exchange markets. With the collapse of Bretton Woods system, the major currencies of the world economy shifted to a ‘floating exchange rate’ regime. This lessened the impact and utility of the SDR. Along with this, the international capital markets grew to facilitate borrowing by creditworthy governments, reducing their dependence on the IMF. However, the Special Drawing Rights (SDRs) did play a crucial role in providing liquidity during the global financial crisis, to the world-wide economic systems and supplementing IMF’s member countries’ official reserves.